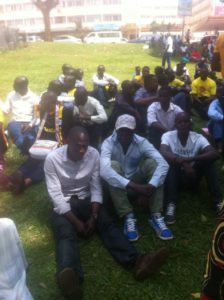 Traders prepare to match in support of lifting the age limit at Railway Grounds in Kampala today. Photo by Raymond Mayanja. KAMPALA–A group of informal sector players this morning gathered at the Railway Ground in the city centre to march in support of lifting the presidential age limit. They included market vendors, taxi drivers and conductors as well as bodaboda cyclists. Accompanied by a music band and guarded by the police, the marching throng weaved through Railway Grounds, to Parliament and thereafter movedfs along Kampala Road. Ssematimba, the chairman of Kampala Operational Taxi Stages Association, said they are supporting the lifting of the age limit as a sign of appreciating President Museveni for what he has done for them. “He has helped solve the wrangles in the taxi business and scrapped multiple taxations. He has also given market vendors money to boost their SACCOs,” Sematimba said. The Boda Boda 2010 Association, an organisation which brings together commercial cyclists in the city, said it’s backing the campaign because of the prevailing peace and stability in the country. “We are able to work throughout the night. Those of us who are wise invest the money while the fools marry more women,” said Antanas Kafeero, the association’s chairman. 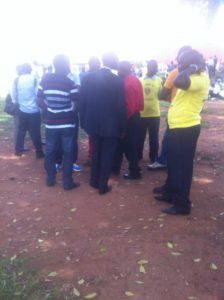 The demonstrators gather at Railway Grounds in Kampala shortly before the march today. Photo by Raymond Mayanja. As the debate to amend Article 102(b) of the 1995 Constitution rages on, especially among politicians who support President Museveni as well as his critics, several NRM party supporters, especially from Northern Uganda, have been seen showing their support to the lifting of the age limit. But some players in the opposition are fighting tooth and nail to block the moves. Ibrahim Kasozi, Makindye East legislator, one of the MPs against the lifting of the age limit reveals that they are not throwing in the towel. “We are aware that Museveni is bankrolling those groups to hoodwink the public that lifting the age limit has popular support. This time, we decided to be silent but while making political circulations, but take it from me, Museveni will not contest in 2021,” Kasozi stated. To remove term limits, legislators were given Shs 5 million in 2005 as facilitation. Kasozi said that they are aware that even this time, money will be given out, but he warned his fellow MPs. “We shall decampaign them by financially supporting their rivals,” he added. Dr Abedi Bwanika, the president of People’s Development Party (PDP), also said his push to have a referendum on the contentious issue is at advanced stages. Separately, a group of youth from NRM is working hard to market the idea. Association, Kick Age Limitations out of the Constitution (KALOC) was formed recently. MP Simeo Nsubuga, one of the founders of this association, said many MPs are in support of lifting the age limit.